20 Feb 2017 ---- Campbell Soup has reported lower-than-expected quarterly sales, hurt by weak demand for its beverages, broth and condensed soups, sending its shares down by 8 percent. The fall was Campbell's biggest percentage loss in over eight years, after the soupmaker also said it did not expect sales to rise in its C-Fresh unit in fiscal 2017. Sales decreased 1 percent to $2.171 billion driven by the decline in organic sales, partially offset by the favorable impact of currency translation. Organic sales decreased 2 percent driven by lower volume and higher promotional spending. Sales decreased 1 percent to $4.373 billion driven by a 1 percent decline in organic sales, partly offset by the favorable impact of currency translation. In fiscal 2015, Campbell launched a comprehensive reorganization and multi-year cost savings initiatives with targeted annualized cost savings of $300 million by fiscal 2018. Campbell now expects to achieve $300 million in cost savings by the end of fiscal 2017, a year earlier than anticipated. Based on the success of the program to date and the identification of additional savings opportunities, the savings target is being increased from $300 million by the end of fiscal 2018 to $450 million by the end of fiscal 2020. Campbell continues to expect sales to increase by 0 to 1 percent, adjusted EBIT to increase by 1 to 4 percent, and adjusted EPS to increase by 2 to 5 percent, or $3.00 to $3.09 per share. This guidance assumes the impact from currency translation will be nominal. A non-GAAP reconciliation is not provided for 2017 guidance since certain items are not estimable, such as pension and postretirement mark-to-market adjustments, and these items are not considered to be part of the company's ongoing business results. Sales in the quarter were comparable to the prior year at $1.231 billion. 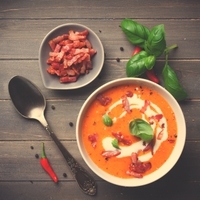 Excluding the favorable impact of currency translation, segment sales decreased 1 percent driven by declines in V8 beverages, partly offset by gains in soup, Prego pasta sauces and Plum products. Sales of US soup increased 1 percent driven by gains in ready-to-serve soups, mostly offset by declines in broth and condensed soups. Segment operating earnings increased 8 percent to $313 million. The increase was driven by a higher gross margin percentage, partly offset by increased advertising and consumer promotion expenses. Sales in the quarter were comparable to the prior year at $680 million. Excluding the favorable impact of currency translation, segment sales decreased 1 percent primarily driven by declines in Kelsen, primarily in the US, and Arnott’s biscuits, partly offset by gains in Pepperidge Farm. Pepperidge Farm sales increased due to gains in Goldfish crackers and Pepperidge Farm cookies, partly offset by declines in fresh bakery and frozen products. Segment operating earnings decreased 4 percent to $135 million. The decrease was primarily driven by a lower gross margin percentage. Sales in the quarter decreased 8 percent to $260 million driven by lower sales of carrots, Bolthouse Farms refrigerated beverages, and Garden Fresh Gourmet, partly offset by gains in refrigerated soup. Segment operating earnings decreased from $21 million to a loss of $3 million reflecting increased carrot costs due to the adverse impact on crop yields of heavy rains in December and January, as well as the cost impact of lower beverage operating efficiency and lower sales. “We continued to over-deliver on our cost savings initiative, and now expect to achieve our target a year ahead of schedule. We have increased our savings target from $300 million by the end of fiscal 2018 to $450 million by the end of fiscal 2020. Looking ahead, we expect to improve our sales performance in the back half and are maintaining our guidance for the fiscal year,” she said.